This past Friday, the Mayberry folksiness of Eastman was jolted by the depths of evil. The story of how three-year-old Zack was cruelly beaten to death has brought sadness to most every home in the area. And now as his family and the community grapple with the tragic death of this beloved toddler, the questions of “Why,” “How,” and “What now” begin to fill our brains. We want to know, “Where was God” on Friday, March 14, 2014. God was sitting on his throne in heaven (Col 3:1). He was not caught off guard. Nor was he in heaven wishing he could intervene but lacking the power to act. Our God had the power to stop little Zack’s death. He also had the power to save my son from death last summer. But he chose not to appear either on March 14, 2014 or on July 16, 2013. Although none of us fully sees into the mind of God, the Bible does reveal why Jesus delays his return and allows evil to go on unchecked in many forms. In 2 Peter 3:9-10, we read that, “The Lord is not slow to fulfill his promise as some count slowness, but is patient toward you, not wishing that any should perish, but that all should reach repentance.” Jesus hasn’t come again because he wants to save sinners. When Jesus returns to earth, he will descend with a flaming sword to judge the wicked. Once he breaks through the clouds, sinners will have no hope of salvation. Consequently, God waits not because he has forgotten justice, not because he powerless to stop evil, and not because he cares little about human suffering. He waits so that he can extend grace and salvation to the lost. As believers, we should long for Jesus to return, praying for him to come quickly and end the violent suffering that Zack and many others have experienced. On that glorious day, babies will no longer die; old men will not tire (Isaiah 65:20). Until then, let’s redeem these evil days by proclaiming the gospel to a lost and dying world. When Jesus was asked in Luke 13 about why certain men suffered a violent death, he responded by calling men and women to repent. When our community asks about this tragedy, let’s share the gospel. Christ is coming back! “The day of the Lord will come like thief and the heavens will pass away with a roar, and the heavenly bodies will be burned up and dissolved, and the earth and the works that are done on it will be exposed” (2 Peter 2:10). Be with those suffering. 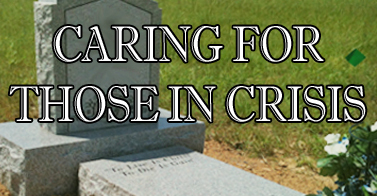 The first step towards ministering to those who are grieving is to grieve (Rom. 12:15). Jesus wept when he went to see Lazarus (John 11:35). Job’s friends understood this principle as well, initially sitting with Job in silence for seven days because they “saw that his suffering was very great” (Job 2:13). Meet physical needs. The best way to demonstrate our love of God of others is to practically minister to those in crisis (Matt. 4:10; James 2:18). Don’t assume you know why a person or family is suffering. I do not know specifically why I or others suffer. And quite frankly, no human being can know “why” apart from divine revelation. To presume to know the divine reasoning for why someone suffers and why someone else rejoices is the height of human arrogance. By appointing yourself god, you will only bring despair and pain to those who are hurting. God’s thoughts are far higher and better than ours (Isaiah 55:8-9). Resist the temptation that overcame the disciples in John 9 and Job’s friends. Do not encourage sin. In many physiological circles people are told to get angry with God when they suffer. However in scripture, we are told to respond with faith and trust (Proverbs 3:5). We should hate all human sin and mourn the fallen pains of nature. But we should not encourage those who are suffering to blame God as Job’s wife did. Rather, we should encourage them to be like Job and not “sin or charge God with wrong doing” (Job 1:22). Point the broken hearted to the God who comforts the weak. Romans 8:28-39 is by far one of the best passages for developing a theology of suffering. But I would not open to Romans initially. Begin with God’s goodness. Offer the hurting expressions for their grief and reminders of hope by turning to Psalm 23, or Lamentations 3:1-26, or Psalm 34. Remind them that God is here and will care for his children. Encourage them with the truth that babies and innocent children are taken to heaven at death. David was able to stop grieving for his dead son because he knew his son was in paradise (2 Sam. 12:23; I Kings 14:12-13). Speak truth in love, seeking to edify. Everything we post on Facebook or tweet should be done to encourage and help the family, keeping their situation in mind. Refrain from gossip and idle chatter (Eph. 4:29). Continue loving them in the days ahead. As Christians, we should respond to crisis, but ministry continues for a lifetime (I Peter 4:10-11). Pray for them, asking God to love them, comfort them, and meet their needs through his divine power (Col. 1:11). This was very touching. I am family of Zack Smith and it is very hard to deal with or figure out what is goin on rite now. But its the Good Lord that will get us all threw! To Each Of You, It Is In God’s Hand’s Now.Love You All. Great thoughts of comfort for those who are in pain and hurting. Sometimes its hard to trust God – but He is all there is to trust in! Very true! God is always faithful!